Do you want to create and deploy AS/400 and iSeries Java applications that really work? 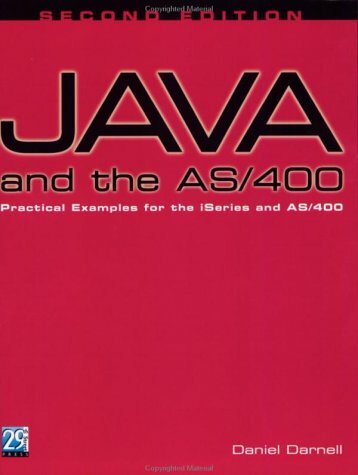 In Java and the AS/400, Daniel Darnell ignores all the hype and gets down to practical examples to help you understand how Java works in the AS/400-iSeries environment. Not just another Java tutorial, this detailed book takes you through everything you need to know about the implementation of Java on these systems and guides you through several small application examples to teach the techniques and technologies available today for AS/400 development in Java. The fully revised Second Edition provides updated coverage of the products and tools that play into AS/400 Java development efforts (Chapter 2), expanded and revised coverage of the Java environment on the AS/400 (Chapters 4, 5, 6, and 7) expanded and revised coverage of the AS/400 Toolbox for Java (Chapters 8 and 9), and two completely new chapters. Chapter 11 helps you sort out the enhancements to ILE RPG that let you directly manipulate Java objects in your RPG code, and Chapter 12 takes a look at the tools and techniques used to develop Web applications, including a sample application deployed to the AS/400's Apache Software Foundation Jakarta Tomcat application server. The reality of the software development world today is that programmers must be schooled in client/server, server-only, and Web application development. With the view of this edition broadened to include Java integration features in RPG and the fundamental aspects of Web applications, you hold in your hands a book that includes all three types of application development. Daniel Darnell is a consultant specializing in the modernization of iSeries applications through judicious use of the Java programming language and related technologies. He makes his home in Little Rock, Arkansas, but pines for the mountains of his native Colorado. His experience in the midrange world dates back to the System/34 and System/36. Daniel was an early adopter of Java, recognizing it as the first language capable of bringing object-oriented technology to the level of serious business software development. He was also an early adopter of the AS/400, writing some of the first "native" code for the financial industry. He is a technical editor for iSeries NEWS magazine and the author or numerous articles and tips in the magazine.